A colonoscopy is a procedure to look in the colon for anything abnormal. 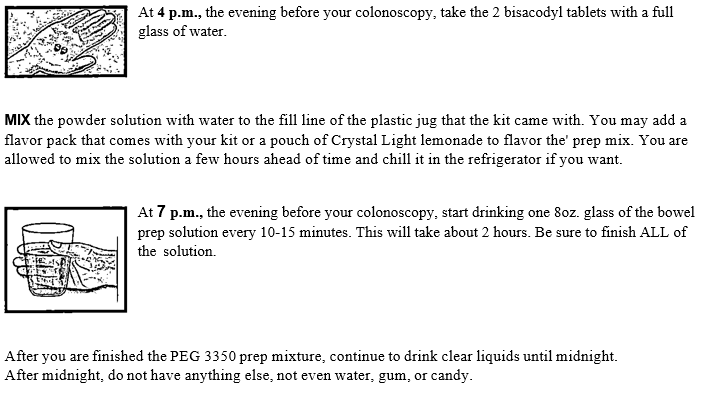 You are only allowed to have CLEAR LIQUIDS the whole day before your colonoscopy. When you go home after your procedure, NO driving or working until the next morning. A nurse from the endoscopy unit will call you several days before to review your instructions and help you with any questions you may have about your procedure. Plan to spend about 1-2 hours at the facility for your procedure. If you take medications for your blood pressure or your heart in the morning, you are required to take them with a sip of water, at least 3 hours before your arrival on the day of your colonoscopy. If you take inhalers or any breathing treatments, do not skip them the morning of your colonoscopy. On the morning of your colonoscopy, do not take any other medications unless your doctor told you to. If you are diabetic, check your blood sugar before you leave the house for your colonoscopy. If you take blood thinners or diabetic medication, be sure to get specific instructions from the staff about possibly stopping these medications. Each patient is different, so be sure to get your special instructions.